Sir Anerood Jugnauth GCSK, KCMG, QC, MP, PC (born 29 March 1930) is a Mauritian politician who has served as both President and Prime Minister of Mauritius. He is Member of Parliament for Piton & Riviere Du Rempart. A central figure of Mauritian politics in the 1980s and 1990s, Jugnauth has continuously (except for the periods 1995–2000 and 2012–2014) held a constitutional office since 1976. He was Leader of the Opposition from 1976 to 1982. He served as Prime Minister from 1982 to 1995 and again from 2000 to 2003. He was then elected as President of Mauritius and served as such from 2003 to 2012. Following his party's victory in the 2014 general elections, he was appointed again to serve his sixth term as Prime Minister by President Kailash Purryag on 14 December 2014. He served four consecutive terms as Prime Minister from 1982 to 1995 and was then voted out of office from 1995 to 2000. He is the longest serving prime minister with more than 16 years of tenure thus overtaking Seewoosagur Ramgoolam, who held the office for 14 years. As leader of the Militant Socialist Movement, he became Prime Minister again, for a fifth term, after the 2000 election. His alliance partner, Paul Bérenger of the Mauritian Militant Movement, succeeded him in 2003 after serving as Jugnauth's deputy for three years. Jugnauth was then elected President in 2003. Often nicknamed as Rambo (a film character known to be unbeatable), he maintained a historical political career as, under his leadership, his party/alliances won 5 general parliamentary elections in a row, those in 1976, 1982, 1983, 1987, 1991. His party/alliances won 7 general elections (out of 8) where he was leader and presented as prime ministerial candidate. He is also the only Mauritian who served as an elected member on each level in the country as he first served as village & town Councillor (being elected as a Councillor for Palma village in 1956 and again Councillor for the town of Vacoas-Phoenix in 1964). He then served as a Member of Parliament (elected in 1963), became Minister of State in 1965 which preceded his appointment as Minister of Labour in 1966 by Seewoosagur Ramgoolam. He then led the MMM in its first electoral campaign and was presented as Prime Minister in 1976. The MMM won but could not govern due to a hung parliament and Jugnauth became Leader of the Opposition up to 1982 where the MMM-PSM alliance won all the seats. He became Prime Minister up to 1995. He was appointed again as Prime Minister in 2000 and finally President in 2003. He is the only prime minister to have had a sibling and his son in his own cabinet from 2000 to 2003. He was called to the Bar by Lincoln's Inn. He was a cabinet minister during the leadership of Seewoosagur Ramgoolam from 1965 up to 1969. In 1970, he moved out and went to the newly created political party of the Mauritian Militant Movement, where he eventually became its leader in 1982. He created his own political party called Militant Socialist Movement in 1983 and was once more elected. His party remained in power up to 1995. In 2000, he was once more elected prime minister and served until 2003, when he was sworn into the presidency. From the beginning of his first mandate as Prime Minister he expressed his country's readiness to establish strong economic ties, particularly in creating technology-based projects with economic feasibility. Jugnauth is credited with the legacy of Mauritius’ "economic miracle" of the 1980s – a set of policies such as the revitalization of the duty-free trade zone and establishing Mauritius as a leader in textiles production – which allowed the island to develop an economic presence in the region. He founded the Militant Socialist Movement party in 1983. He was honoured with Pravasi Bharatiya Samman Awards for his continued support for India's causes and concerns and for strengthening India's relationship with Mauritius. He has expressed his country's readiness to establish strong economic ties, particularly in creating technology-based projects. He was made Queen's Counsel in 1980 and was made a member of the Privy Council in 1983. He was knighted by Queen Elizabeth II in 1988 when Mauritius was still one of the Queen's realms and the Queen was titular head of state. Therefore, he still uses his formal title of Sir Anerood and also the prefix used by Privy Councillors, The Right Honourable. His name is often abbreviated as 'SAJ' being the initials of Sir Anerood Jugnauth. He is currently one of the last Mauritian Knights of the United Kingdom and is the last Mauritian to be member of the Privy Council. Following his resignation as President on 30 March 2012 due to major disagreement with the members of the government., he led the main opposition coalition MSM/MMM from 2012 to mid-2014. However, in April 2014, Paul Berenger announced the dissolution of the coalition due to major disagreement within both parties. Later Berenger announced a coalition between the Labour Party and the Mauritian Militant Movement. Jugnauth is since then leading a coalition composed of the Militant Socialist Movement, PMSD and the ML which is a break-away group of individuals who resigned from the MMM due to the coalition with the Labour Party. Jugnauth's alliance known as "L'Alliance LEPEP" won the 2014 general elections. On 12 September 2016, Jugnauth announced that he would be resigning as Prime Minister very soon due to his advanced age. He confirmed that Pravind Jugnauth would eventually succeed him, being the leader of the Militant Socialist Movement. On 23 January 2017, he eventually resigned as prime minister to make way for his son to become prime minister. While this is view as constitutionally possible under the Westminster system of government, the hand-over of power from father to son has been considered as highly controversial and all opposition parties are organizing major manifestations to denounce this. Anerood Jugnauth was born at La Caverne, Vacoas Phoenix in a traditional Hindu Yadava  family and was brought up there. His grandfather had migrated to Mauritius from the Indian state of Bihar in the 1850s. Brought up in a Bhojpuri medium, he had his primary education at Palma Primary School, where he learned creole, and had his secondary education at Regent College. He taught for some time at New Eton College and later worked as a clerk in the Poor Law Department for some time before being transferred to the Judicial Department. In 1951, he left Mauritius for the UK to study law. In 1964, he was elected Chairman of the Palma Village Council. He was first elected to parliament as an Independent Forward Block candidate in the constituency of Rivière du Rempart District in 1963. He served as a magistrate shortly after his resignation in 1966. In 1969, he was promoted to the Crown Law Office. In 1971, he was made Senior Crown Counsel. In the beginning of the 1970s, Jugnauth joined the Mauritian Militant Movement. He became the president and subsequently the leader of the party. Re-elected at the general election held in 1976 in the constituency of Piton/Rivière du Rempart, he served as Leader of the Opposition from December 1976 to June 1982. Jugnauth trained and worked in law and took an active role in the 1960s negotiations for independence. He was called to the Bar in London in 1954. His political career began with his being elected in the Constituency of Rivière du Rempart in 1963. He was the President of the Palma Village council in 1964. He became Leader of Opposition from December 1976 to June 1982, and he joined the Mauritian Militant Movement in 1970. Anerood Jugnauth was first elected in the constituency No 14 of Riviere du Rempart in 1963 in the National Legislative Assembly and was candidate of the Independent Forward Block.He remained member up to 1967 where general elections were back .He held the office of different ministries . He joined the All Mauritius Hindu Congress in 1965. State Minister for Development in the government of Seewoosagur Ramgoolam from 1965 to 1966, he was promoted Minister of Labour in November 1966. He took part in the London Constitutional Conference on Mauritius. He resigned from his office in April 1967. In 1970 there was the political split of Independence Party and his All Hindu Congress Party,his party was dissolved in the thought of making Communal elections .With this the Muslim Action Committee known as the CAM was also dissolved . The 1976 elections were contested by three of the most popular candidates on the island.These were the Independent Party [IP], an alliance of the Mauritian Labor Party, led by the Prime Minister, Seewoosagur Ramgoolam, and the Muslim Action Committee; Mauritian Social Democrat Party (PMSD) led by Gaëtan Duval; and the Mauritian Militant Movement (MMM) led by Paul Bérenger and Anerood Jugnauth himself. About 460 100 voters of the 0.8 million inhabitants of Mauritius registered, and 88% (404 918) of them actually voted. The election was closely fought, and no party was able to gain a majority of parliamentary seats (see 1976 Legislative Assembly election results). The MMM received most votes, 38.64%, but gained only 34 seats, two short of an absolute majority. The Independence Party (MLP and CAM) gained 37.90% and 28 seats, while the PMSD received 16.20% of the votes and eight seats. By once more forming a coalition with the PMSD, Ramgoolam managed to stay in power, but with a majority of only two seats in the Assembly. Jugnauth in alliance with Paul Berenger became the kings of politics in the island.Seewoosagur Ramgoolam ruled over the house of parliament with only two seats over the others. The Independence Alliance occupied 36 seats while MMM became opposition with 34 seats. Anerood Jugnauth was appointed as Leader of Opposition and he remained to the place until next general elections in 1982. From 1976 to 1982, The MLP had been weakened by the defection of part of its coalition partner, the PMSD, while the CAM declined to contest the election. The MMM had formed an alliance with Harish Boodhoo's Parti Socialiste Mauricien known as PSM. Anerood Jugnauth hoped that this alliance would draw Hindu votes away from the MLP and ensure a MMM victory. The election resulted in a landslide victory for the MMM-PSM alliance (formed by Jugnauth and Berenger in early 1981), which won 64.16% of the vote and all 60 elected seats (42 by the MMM, 18 by the PSM, and two for the allied Organisation du Peuple Rodriguais) (for more detail see 1982 Legislative Assembly election results). Voter turn-out was 87.3%, with 471 196 out of an electorate of 540 000 casting their votes for the 34 parties contesting 62 seats. The LP, which had dominated Mauritian politics since 1948, won no seats and (together with the Muslim Action Committee) only 25.78% of the vote. The PMSD did even worse, receiving only 7.79% of the vote. The LP and the PMSD each did eventually receive two seats in parliament under the best-loser provisions. Anerood Jugnauth became Prime Minister for the first time, Boodhoo Deputy Prime Minister, and Paul Bérenger Minister of Finance. Jugnauth swept to power in 1982 in a dramatic election in which his MMM-PSM alliance won all seats in the Legislative Assembly. When he took the office, the country was wrecked by chronic unemployment, rapidly rising inflation and the infinite expectations of a volatile and highly politicized electorate. Within months of his election victory, he saw his massive and unassailable majority collapsing before his eyes as his political party tore itself apart through bitter in-fighting over personality and policy. He presided over the country's rapid industrialization. In late 1982, the two party leaders, Harish Boodhoo and Paul Berenger were both wanting absolute power over the Alliance, this led to their break up where the MMM & PSM became apart. Jugnauth who was thinking of a new political strategy was expected to resolve the issue but to everybody's surprise, he let both parties go apart. With this Paul Berenger begun war by saying that Jugnauth had no right to control the MMM as he was not leader but only a member. This led to internal fights inside the MMM. Jugnauth being Prime Minister announced general elections in 1983 again. This time he was not a Candidate for the MMM but he proposed to Boodhoo of dissolving the PSM to make a new more stronger Party called the MSM (Militant Socialist Movement).He created the MSM and in Alliance with the Mauritian Labor Party went to the general elections together trying to fight against Paul Berenger and his MMM. Almost from the beginning, the governing alliance was rent by serious differences, partly of a personal nature but also over Bérenger's stringent economic policies and his attempt to make Creole the national language (despite the Indian descent of the majority of the population). In March 1983, the government collapsed when the dominant faction within the MMM [Mouvement Militant Mauricien], led by Bérenger, split from Jugnauth's leadership and resigned from the cabinet. In early April 1983, Jugnauth formed a new party, the Mouvement Socialiste Militant (MSM), which, in May, amalgamated with the PSM led by Boodhoo, and was renamed the Militant Socialist Movement (MSM). However, the new government lacked a majority in the legislative assembly, and Jugnauth was obliged to dissolve the assembly in June. New elections were set for August 1983.Re-elected at the general elections held on 23 August 1983, Jugnauth was re-elected as prime minister The MMM fought the election alone. Jugnauth's MSM formed a new coalition – called the Alliance – with the Labour Party and the PMSD [Parti Mauricien Social Démocrate], the very parties that only a year ago had been ousted from power by the MMM, which was then led by Jugnauth. The popular vote was very close (for detail see 1983 Legislative Assembly election results). The MMM received 209 845 votes (46.4%) – the highest proportion of the vote ever received by a single party in any Mauritian election. The Alliance received 236 146 votes (52.22%); independents and the Rodrigues parties got the remaining 1.38% and two seats. Of the 552 800 registered voters, 452 221 (81.8%) had voted. When seats were distributed, however, the Alliance held a substantial majority – 46 to the 22 received by the MMM. The disproportionate weighting of seats reflects the fact that MMM votes were concentrated in urban constituencies where large numerical majorities won only three seats, whereas the Alliance swept the rural constituencies where Hindus predominated. The election was a personal victory for Jugnauth and something of a comeback for Duval, who became deputy prime minister, and Ramgoolam, who was named Governor-General shortly after. Commenting on the MMM's fourteen months in power and the outcome of the 1983 election, Bowman (1991, 87) remarks that Mauritius worked itself "through a tumultuous political period in an orderly, constitutional way, without violence. Prominent leaders left power gracefully and allowed other parties and individuals to accede to leadership roles." And whereas the MMM had been historically viewed as a more radical party than the MLP, once in power it actually provided considerable continuity of leadership. The years following the 1983 elections were marked by an endless succession of intra- and inter-party feuds as well as scandals involving high government members and officials in corruption, fraud and drug trafficking. Within months of taking office, the Alliance began a process of fragmentation that by 1986 left the government without a working majority in parliament. When in February 1984, the MLP (Mauritius Labour Party) left the government, 11 of its MPs continued to support the government and formed a faction within the MLP called the Rassemblement des Travaillistes Mauriciens (RTM). Upon proroguing parliament in November 1986, Jugnauth agreed that an election was necessary. Parliament was dissolved on 3 July, and the election date set for 30 August 1987, one year ahead of schedule. Campaigning started on 22 July 1987. The campaign was fought intensely but with less bitterness and blatant communal hostility than had been the case in the past. Jugnauth's Alliance fought the election with his MSM (Militant Socialist Movement), Duval's MPSD (Parti Mauricien Social Démocrate), and both major factions of the MLP, the one led by Satcam Boolell and the RTM. The MMM allied itself with two small parties, the Mouvement Travailliste Démocrat (RTD) and the Front des Travailleurs Socialiste (FTS). A total of 639 488 voters were registered (approximately 60% of the total population) and of these, 546 623 (85.5%) cast their votes. A total of 359 candidates ran for the 62 elected seats. The ballot, like the electoral campaign, was held in an impassioned atmosphere, but there were no serious incidents. During the election campaign, the ruling MSM/MLP/PMSD alliance was known as the Sun (Soleil) and the opposing union (composed of MMM/MTD/FTS) as the Heart (Coeur) after their respective emblems. While overall participation of voters in the polling amounted to 85.5%, it ran up to 93% in some constituencies. The average size of the multimember constituencies was around 30 000. As in previous elections, the MMM and its partners received the highest percentage of votes, 48.12%, of which a small percentage can be attributed to its two small partners (see 1987 Legislative Assembly election results for more detail). It won 21 seats, comprising 19 of the 30 urban seats, and only two of the 30 rural seats. The Alliance (MSM/PMSD/MLP) won a total of 49.86% and 39 seats. After the best-loser seats were allocated, the Alliance held 46 seats to the MMM's 24. The two seats of the Organisation du Peuple Rodriguais helped to raise those of the Alliance to 46. The outcome of the election highlighted an anomaly of the electoral system. A mere 1.7% of the votes cast separated the two political alliances, but in terms of seats, the gap was 36.6 percentage points. The opposition called for electoral reforms, but the winning alliance was quite happy with things as they stood. The outcome of the 1991 general election added further impetus to demands for reform. The MSM had drawn its main support from the Hindu community (52% of the total population), particularly from the numerically dominant Vaishya caste, which included Jugnauth among its members. The MSM was also favoured by the economically dominant Chinese and Franco-Mauritian communities. The MMM's support was concentrated in the Muslim Indian community (17% of the total population), in sections of the Creole community (27%) and in the lower Hindu castes, particularly those of southern Mauritius disaffected with Vaishya dominance in the north. Of the smaller ruling parties, the MLP also represented higher-caste Hindus, while the PMSD was strong in the Creole community. Jugnauth was once more elected with a majority in the Parliament and was once more elected as Prime Minister and took office for his 3rd term. On 6 August 1991, Jugnauth dissolved the national assembly and announced that a general election would be held on 15 September, nearly a year early. Jugnauth led an alliance of his MSM (Militant Socialist Movement) with the MMM (Mauritian Militant Movement) and the RTD (Rassemblement des Travaillistes Mauriciens) against an alliance of the MLP (Mauritius Labour Party) and the PMSD (Parti Mauricien Social Démocrate). The MSM/MMM/RTD alliance was better prepared than the opposition. Before the election date had been announced, it had already drawn up its list of candidates for the 20 constituencies and published its election manifesto. The opposition lost valuable time with lengthy negotiations concerning candidates and manifesto. The latter offered nothing new to the electorate and was broadly similar to the policies put forward by the government. Some 25 parties and independents and 331 candidates were involved. According to official figures, 682,000 voters (about 63% of the total population of 1,083,000) were entitled to vote, and of these about 576,300 (84.5%) turned out (see 1991 National Assembly election results for more detail). The government alliance's 56.3% of the vote gave it 57 seats in parliament, while the opposition's 39.9% of the vote gave it only three seats — an even more glaring discrepancy than in 1987 (see 1987 National Assembly election results). Only four best-loser seats were allocated. Jugnauth once more ruled in Parliament House for a fourth term, and was once more elected prime minister reigning as the supreme king of politics. When Prime Minister Jugnauth lost a vote of confidence over a language issue that required an amendment to the constitution, he dissolved parliament on 16 November 1995 and called a snap election for 20 December. Candidates had to be nominated by 4 December, and the campaign was officially opened on 5 December. A record 506 candidates entered the fray in which some 42 parties and independents participated. A landslide victory for the opposition ended Jugnauth's rule as prime minister which had lasted since 1982. The Labour Party-Mauritian Militant Movement (MMM) alliance captured all 60 of the directly elected seats on the island of Mauritius with only 63.7% of the poll, representing a mere 51.1% of the total electorate. The two seats on the island of Rodrigues went to l'Organisation du Peuple de Rodrigues (OPR). The MSM-RMM alliance obtained 19.3% of the votes cast or the support of 15.4% of the total electorate, but even under the best-loser system it found itself without a single seat in the National Assembly. (Renouveau Militant Mauricien (RMM) was the name adopted by a substantial part of the MMM led by Dr Prem Nababsing after Bérenger had broken away from it in 1993 and retained the right to the name of MMM). Only four best-loser seats were allocated and went to small parties with little national influence – two to the Mouvement Ridriguais in Rodrigues island and the other two respectively to the Hizbullah Party and the Parti Gaëtan Duval (PGD, formerly the PMSD). The best-loser system clearly encourages communal politics. A close analysis of voting patterns reveals that people voted largely according to communal divisions. The Islamist Hizbullah Party, one of the newer parties, had exploited the voting system by appealing to a very narrow section of the population and managed to secure a best-loser seat. The crushing defeat of the MSM-RMM alliance was partly due to the practice of communal politics; both parties were headed by Hindus and therefore failed to attract non-Hindu supporters. The vast majority of Creoles and the Muslims voted for the Labour Party-MMM alliance, while the Hindu voters were split between the two opposing political camps. Another reason was that voters, even though they acknowledged the economic progress made under successive Jugnauth governments, apparently wanted change for the sake of change. Anerood Jugnauth stood as a candidate at the by-election held in constituency No. 9 (Flacq/Bon Acceuil) in April 1998 but was defeated. He immediately initiated the idea of an MSM/MMM federation which eventually took shape in January 1999. However, the Federation was dissolved after the defeat of its candidate at the by-election held on 19 September 1999. Jugnauth founded the MSM/MMM Alliance together with Paul Bérenger, leader of the MMM, on 14 August 2000, based on equal sharing of power. At the general elections held on 11 September 2000, he was elected as first member of constituency No 7 (Piton/Rivière du Rempart) and was appointed as Prime Minister. The outgoing prime minister, Navin Ramgoolam of the Mauritian Labor Party, led a coalition with Xavier Luc Duval, the leader of the Parti Mauricien Xavier Duval (PMXD). Duval was Minister of Finance in the previous government alliance formed in mid-1999. The other alliance was formed (for the fourth time) between Sir Anerood Jugnauth (MSM) and Paul Bérenger (MMM). The MSM sought to appeal to the Hindu community while the MMM tried to base its membership from across the spectrum in Mauritius. On 15 August 2000, the leaders of these two parties as well several other leaders from much smaller parties signed what they termed a 'historical electoral accord'. The most outstanding aspect of this accord was the proposed sharing of the prime ministerial post between MSM leader Sir Anerood Jugnauth and MMM leader Paul Bérenger. Under this arrangement, Jugnauth would hold the post of prime minister for the first three years and Bérenger for the remaining two years. After surrendering the premiership to Bérenger, Jugnauth would be called to assume the function of President of the Republic after reforms to strengthen the presidency, which was largely a symbolic post. The MSM/MMM alliance argued that this reform was necessary because the prime minister held too much power in Mauritius, including the right to dissolve parliament and call for fresh elections. They charged that this system created the opportunity for abuse. They illustrated this by recalling that Dr Ramgoolam dissolved parliament on 10 August 2000, issued the writs of election on the same day, fixed the nomination day for 26 August 2000 and the poll day for 11 September 2000, leaving the opposition only 32 days to organise. The accord also provided for a reform of the electoral system to replace the "best losers system" gradually by proportional representation, and to end the Mauritius Broadcasting Corporation's monopoly over the electronic media. In addition to sharing the post of prime minister, what made the MSM/MMM electoral accord exceptional was the fact that it would allow, for the first time in the history of the island, a non-Hindu Mauritian to become the prime minister. The elections took place on 11 September 2000 with a total of 80.87% of registered voters casting their ballots. The MSM/MMM alliance won a resounding victory with 54 of the directly elected seats. In early 1999 when the Labor Party and MMM decided to end up their team, MMM became the opposition party and MLP formed the government.Sir Anerood Jugnauth then initiated the idea of the "Medpoint Deal". The MSM led by Anerood Jugnauth and MMM led by Paul Bérenger agreed that if they won the election Anerood Jugnauth would become Prime Minister. They agreed that after three years he would step down as Prime Minister to become the President of Mauritius with enhanced powers and Bérenger would become Prime Minister, the first non-Hindu to do so. The idea was both agreed by the MSM members and MMM members. It was agreed that Paul Berenger would remain Deputy Prime Minister and Minister of Finance for three years up to 2003 and after that would take up the leadership of both parties becoming prime minister for the rest of the term thus up to 2005. He was prime minister for 21 months. They formed up the MSM/MMM in 2000. Jugnauth agreed to step down and become President as from 2003. Former president Karl Offmann was also of the game. He was put to the office of the president with the condition that he would remain president only for 19 months. Jugnauth became president under the transition with the so-called "sudden" resignation of President Offmann. Jugnauth resigned as prime minister on 30 September 2003 at 13:30 and also as member of parliament at 15:00, giving his resignation letter to Speaker of the House on the same day. He announced his departure in a 20-minute speech given to the members of parliament stating that he was leaving the office to make room for a new prime minister. "Everything said and done about me, I am proud to go down in history as a no-nonsense, honest and dedicated prime minister having done my duty in good faith and without fear or favour. I have understood our political adversaries and, taken at its most, all divergent views and attitudes have been mere manifestations to our democracy at its best", said Jugnauth in the speech before his departure. He was sworn into the presidency on 7 October 2003 following the resignation of President Karl Offmann. Sir Anerood along with Lady Jugnauth took over the keys of the Chateau of Reduit on 7 October 2003. His election to the presidency was largely approved by the entire population as it was considered to be the new era of Mauritian politics, allowing Paul Berenger to become prime minister who was the first person of a non-Hindu religion to become head of government. In 2003, he handed the leadership of his party to his son Pravind Jugnauth. He announced that he had "reached the end of this road". During his first mandate, due to the constitution, he had to announce general elections, which eventually took place in July 2005. The new prime minister elected Navin Ramgoolam, called him "a sitting duck" who is still yearning for power. He remained president until the end of his 5-year term, ending in 2008. Due to the end of the mandate of Sir Anerood, two persons, Vice President (Angidi Chettiar) and himself were the two persons nominated to the Presidency. He was voted for by both governing members of parliament as well as opposition MPs. Jugnauth was elected to the ceremonial post of President in 2003. After five years in office, he was re-elected by the National Assembly in a unanimous vote on 19 September 2008, supported by both the government and the opposition. Parliament voted for SAJ to remain as President for a second term in 2008. Shortly after, during the by-election of 2008 in constituency No 8, the Militant Socialist Movement won with the support of the Labour Party and Pravind Jugnauth returned as MP for that constituency. In 2010, two days after his 80th birthday, the Labour-MSM-PMSD alliance was made and Navin Ramgoolam dissolved the parliament in respect for general elections.The alliance won the election and the MSM returned 13 Mps. However, in August 2011, the alliance broke and the MSM left the government leaving a very small majority for the Prime Minister . 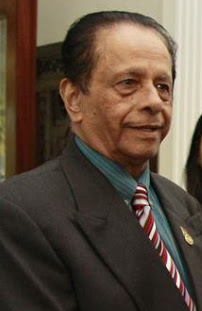 After having a private meeting with Paul Berenger, the leader of the opposition, Jugnauth made a statement that he might resign as President if the situation got any worse concerning the Medpoint scandale which involved his son, Pravind Jugnauth and who was summoned and arrested by the Independent Commission Against Corruption on conflict of interest. Eventually he resigned as President on 30 March 2012. He mentioned that he did not support government policies, many thought his disagreement stemmed from the fact that the government refused to help his son Pravind Jugnauth, accused of corruption, to escape from the law. He stated that he resigned because of his disagreement with the members of the government. Soon after his resignation from Presidency in 2012, Paul Berenger proposed a 'remake' of the MSM/MMM coalition (see the Medpoint Deal above for further reference) which was approved by both parties' structures (political bureaus and central committees). Jugnauth became leader of the alliance with the same conditions. He would hold office of Prime Minister for 3 years before resigning to make way for Berenger. Following internal crisis between both parties in 2013 and early 2014, Berenger announced two 'cooling off' periods to allow time to resolve these issues. In January 2014, Berenger and Jugnauth had a major disagreement on an eventual position of Pravind Jugnauth in a MSM/MMM government. While the MMM wanted Reza Uteem to become number 3 of the government (after Jugnauth and Berenger), the MSM pressed that this position should be given to its leader Pravind. Furthermore, Berenger disagreed with the legal strategy of Pravind Jugnauth's lawyer, Roshi Badhain, to ask for charges to be written off against him in the Medpoint scandal. Berenger initially suggested an early trial. Berenger announced the end of the MSM/MMM in April 2014. He was criticized as he had (on the eve) attended Jugnauth's birthday party and gave a very flattering speech on his political career. After the party, he went in the same night to meet Navin Ramgoolam at a nearby restaurant to discuss a forthcoming alliance. He further announced an alliance between his MMM and Ramgoolam's labour Party. When prime minister Ramgoolam dissolved parliament in end of November 2014, Jugnauth and the MSM conducted an alliance with the PMSD and Mouvement Liberateur (a dissident MMM party led by its former Deputy Leader, Ivan Collendaveloo). His alliance won 47 out of the 60 seats contested. Anerood Jugnauth became prime minister for the sixth time and made history as he led an alliance that won against a Labour Party-MMM alliance which are considered as the two biggest parties (through their significant electorates) in the country. The MSM which was lost much of its rural electorate was since Jugnauth retirement considered as the third national party. It nevertheless got its core electorate (from the 1980s) back following its appeal to vote for SAJ for a last time as he announced it would be the last election he would contest due to his advanced age. Jugnauth has received many accolades and remains high in approval ratings of former prime ministers of Mauritius. However, he has been subjected to various controversy over his 35 years of being on the front bench of Mauritian politics. In 1983, he was criticized for breaking the MMM-PSM coalition government and ousting the MMM from power. In 1984, he was criticized as head of government in the Amsterdam boys scandal which involved 4 government MPs who were arrested as they were carrying drugs from the Netherlands. He prorogued parliament in an objective to prevent any questions on the investigation. This was seen as extremely controversial. In 1988, he fired Satcam Boollell, then leader of the Labour Party, due to political disagreements. This was again viewed as immoral as the Labour Party had been essential for the MSM to win the 1987 general elections. In May 1992, a major scandal erupted when the Bank of Mauritius issued a new Rs 20 note having the portrait of Sarojini Jugnauth. It was considered to be a birthday gift from Anerood to his wife. This was a major controversy whereby Jugnauth himself had to apologise in parliament to a private notice question from the opposition. He confirmed that he had reluctantly agreed to the proposal of the Bank of Mauritius to issue such a note. He expressed his sincere apologies and assured the population that he shall not commit such a mistake in the future. In 1995, months before the general elections which Jugnauth would lose massively, the then government gave a contract to Sun Trust Building (owned by the Jugnauth family) for a period of 10 years. This was high controversial as Jugnauth was the owner of the Building and at the same time was prime minister. The newly elected Labour Party-MMM government decided to rescind the contract. Jugnauth sued for damages and received Rs 45 millions (US$1.5 million) as compensation. This was highly criticized in the press and among the Mauritian diaspora. Lastly, his resignation in favour of his son in 2017 as prime minister has been viewed as undemocratic and immoral despite being constitutional as Pravind Jugnauth was not presented as leader and eventual prime minister in case of a Lepep coalition victory. Anerood Jugnauth committed himself to serving as prime minister for a full 5-year term. The press and the opposition campaigned that he had broken his word given to the Mauritian people. Jugnauth is the owner of one of the most famous building companies on Mauritius, located at the Sun Trust Building situated at La Rue Edith Cawell, Port Louis. The same building was the subject of controversies and critics after its floor renting prices were at the highest peak of the national market. The Government Ministry of Education department was there up until 1995 when newly elected Minister, the late Burty David, refused to work in the building. The government therefore allocated the department in another building and the penalty paid to Jugnauth in terms of breach of contract was amounted to Rs 45 millions (equivalent to $1.5 million (USD)). He is the patriarch of the Jugnauth Family of Mauritius. Jugnauth married Sarojini Ballah on 18 December 1957, and he is the father of two children: Pravind and Shalini. Pravind is the ex Minister of Finance of the Country and serves as a Member of Parliament for the Constituency Moka & Quartier Militaire. Pravind is the leader of the Militant Socialist Movement and is married to Kobita Ramdanee. Jugnauth's daughter, Shalini, is also married. Jugnauth is the grandfather to five grandchildren: Anusha, Divya, Sonika, Sonali and Sara. In 2007, Jugnauth threatened to leave the Commonwealth in protest at the UK's "barbarous" treatment of the people of the Chagos Islands. Jugnauth stated that he might take the UK to the International Court of Justice over the islanders' plight. The Chagos Islands, a British colony in the Indian Ocean, were leased to the US in the 1960s to build a military base.The residents were forced out, and the government says they cannot return, but have been granted UK citizenship. Many of the residents now live in poverty in Mauritius, or as refugees in the UK. The American base was built on the large island of Diego Garcia within the Chagos archipelago. Mauritius claims the islands as part of its territory, and Jugnauth claimed his country was forced by the British to accept the Chagossians as a condition for independence. Jugnauth was a well known enemy of Navin Ramgoolam and his party, the Labour Party. In the 1987 elections, Sir Satcam Boolell, the leader of the Labour Party, did not approve the coalition between Jugnauth's MSM, Duval's PMSD and their parties. This led to their official break up in 1988 but 11 members of parliament continued to support the MSM and thus broke the Labour Party in two blocks. Jugnauth managed to keep a working majority and once again remained Prime Minister until 1991, when he called for new elections. The MSM made an alliance with the MMM and one block of the broken Labour Party namely the Democratic Labour Movement (MTD), led by Anil Baichoo, a minister which recently merged again with the Labours. The 1991 elections saw Jugnauth remaining in power for a third consecutive term. Navin Ramgoolam and other leaders of the Labour Party denounced the authoritarian style of leading the cabinet. In 1995, Ramgoolam proposed an alliance to the MMM and the result was the Labour-MMM alliance won all the seats thus making the second 60–0 of Mauritian political history. Jugnauth lost his seat in his constituency and this was the worst defeat that the MSM team had experienced since its creation. In 2005, Jugnauth suffered one of the biggest humiliations in politics. Ramgoolam and the Social Alliance which won the elections demanded that Prime Minister and all ministers shall be appointed in front of the government house in public which is normally carried out at the State House in front of the President. It was noticed when appointing Ramgoolam, Jugnauth wanted to shake hands, but the other man refused, stepping aside. In May 2010, as the MSM joined hands with the Labour Party, Jugnauth released a press interview in the newspaper stating that he never liked the MMM and that they never had the intention to pursue development but rather strive for power only. He mentioned that Paul Berenger should not be trusted and Ramgoolam would be a better choice. The consequences were that the MSM-Labour alliance won together 41 seats with the support of the Social Democrats. Jugnauth will bear the title Right Honourable for life. He is also entitled to use MP post-nominal and prefix, as he was an MP for more than 35 years. Anerood Jugnauth has been given much popularity as of 2011, he will be celebrating nearly 50 years as a known personality of the country. He is one of the only two Prime Ministers who served under Queen Elizabeth II and the pre-republic regime. There is one primary school in his former constituency, Riviere du Rempart under his name, known as SIR ANEROOD JUGNAUTH GOVERNMENT SCHOOL situated in the north of the country. He has also a commemorative golden Mauritian rupee coin issued by the Bank of Mauritius having his portrait on the obverse and a Dodo on the reverse. The inscriptions are "THE Rt HON SIR ANEROOD JUGNAUTH PC, QC, KCMG " and is followed by "MAURITIUS". It originally holds a value of Rs 1,000 but is sold as a collection piece at US$1,881. He has been viewed as a rather right and down to earth person. Lately on 19 December 2010, he and his wife, Sarojini Ballah went to receive an official opening of a pictorial biography of the President himself showing his path from small age poor child to him being President of Mauritius in 2010 leaving behind him a rich career as one of the leaders of the country. The biography is entitled The Rise of a Common Man. Present at the ceremony were former Prime Minister Navin Ramgoolam, Vice Prime Minister Pravind Jugnauth and other ministers as well as friends of the latter. ^ "YourLocalNews.ca - TC Media's local information websites". Retrieved 9 July 2016. ^ "5plusltd.com - 5plusltd Resources and Information". Retrieved 9 July 2016. ^ "Welcome msmparty.org". Retrieved 14 December 2014. ^ a b "Mauritius president announces resignation". Retrieved 14 December 2014. ^ a b "Mauritius president quits in row with PM". News24. Retrieved 14 December 2014. ^ "Le Militant – Journal Electronique du Mouvement Militant Mauricien". www.lemilitant.com (in French). Retrieved 14 June 2018. ^ "[Audio] Pravind Jugnauth Premier ministre ? "Pena lot choix", affirme sir Anerood Jugnauth". Defimedia (in French). 12 September 2016. Retrieved 14 June 2018. ^ Heerah, Hashwini (8 May 2015). "Gender and Politicised Religion". ^ "Non-Existent Domain". Retrieved 9 July 2016. ^ "Mauritius". Retrieved 14 December 2014. ^ "Elections in Mauritius". Retrieved 14 December 2014. ^ "Benaam R.A.J. 's cowardly attacks against Cassam Uteem". Ile Maurice. Retrieved 14 December 2014. ^ "B.U. Bridge: Boston University community's weekly newspaper". www.bu.edu. Retrieved 11 October 2016. ^ "Mauritius: Outgoing prime minister delivers parting speech to parliament". Asia Africa Intelligence Wire. 1 October 2003. ^ "BBC NEWS - Africa - Ethnic handover in Mauritius". Retrieved 14 December 2014. ^ "Non-Existent Domain". Archived from the original on 14 August 2016. Retrieved 9 July 2016. ^ "Jugnauth re-elected Mauritius president", AFP, 20 September 2008. ^ "Sir Anerood Jugnauth : un géant de la politique". Defimedia (in French). 23 January 2017. Retrieved 14 June 2018. ^ "IL Y A EU VINGT ANS, LE MOIS DERNIER: L'affaire du billet de Rs 20 - Le Mauricien". Le Mauricien (in French). 6 May 2012. Retrieved 14 June 2018. ^ "L?affaire Sun Trust". lexpress.mu (in French). 28 January 2004. Retrieved 14 June 2018. ^ "President's threat over Chagos". BBC News. 7 March 2007. ^ "President of Mauritius is honoured to receive Doctorate from Middlesex University" (PDF) (Press release). Middlesex University. 13 July 2009. Archived from the original (PDF) on 22 February 2012. Retrieved 22 July 2009. ^ "Non-Existent Domain". Archived from the original on 4 March 2016. Retrieved 9 July 2016. ^ "Mauritius Now Presents New Year's Eve 2014 tickets at The Decorium in London". Retrieved 14 December 2014. This page was last edited on 26 February 2019, at 11:35 (UTC).